In July 2007, an explosion rocked the al-Safir chemical weapons and ballistic missile research facility buried in cavernous underground tunnels dug under a mountain near Allepo in Northwestern Syria. Under the command of the Syrian Scientific Studies and Research Center, Syria’s largest and most secret military facility was constructed by North Korean specialists in the 1990’s. Working in the pre-dawn cool desert temperatures, the blast killed North Korean missile engineers attempting to weaponize North Korean supplied Scud-C missiles with mustard gas chemical warheads at a North Korean built weapons development base near Allepo. photo released by the Syrian official news agency SANA, Syrians walk through the rubble at the scene where multiple explosions hit the center of Aleppo, Syria on October 3, 2012. The mysterious explosion released VX and Sarin nerve agents and mustard gas into the atmosphere, killing at least 15 Syrian military and chemical warfare specialists, “dozens” of Iranians engineers, and at least three North Korean ballistic missile experts. 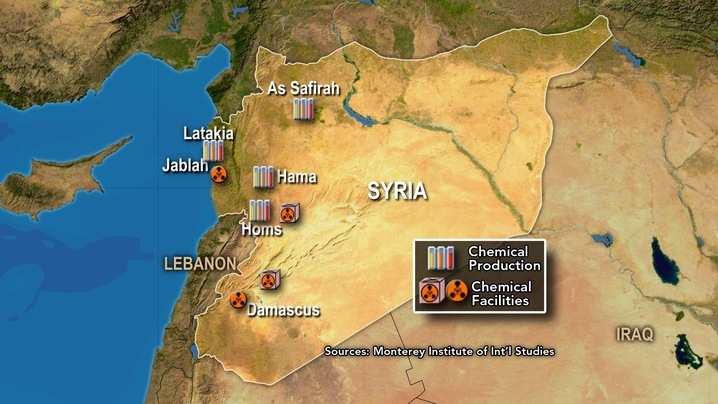 Syrian defense sources told Jane’s Defense Weekly that during a 26 July “test to weaponize a 500 km ‘Scud C’ with a mustard gas warhead, an explosion occurred in a laboratory adjacent to a chemical agent storage facility” at the most heavily guarded military camp in Syria. Less than two months later, in September, 2007, Israeli F-16 fighter jets destroyed a North Korean-designed and constructed plutonium nuclear weapons plant in the remote northeastern Syrian Desert. That assault killed an estimated 10 North Korean nuclear scientists working at the secret nuclear facility near the Euphrates river. North Korean No. 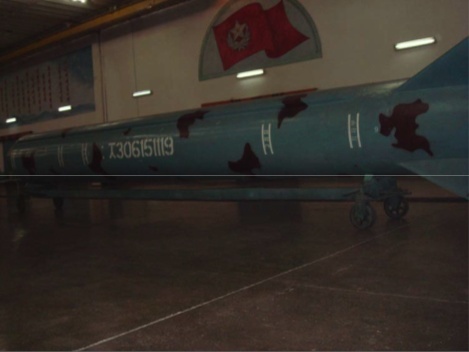 125 Factory, or “Pyongyang Pig Factory” as it is called by North Korea, in Pyongyang, produces surface-to-ship SCUD missiles. 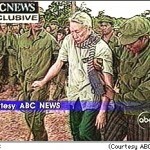 This photo was taken by a secret Burmese military delegation. The factory has also hosted missile buyers from the Middle East, including Syria. 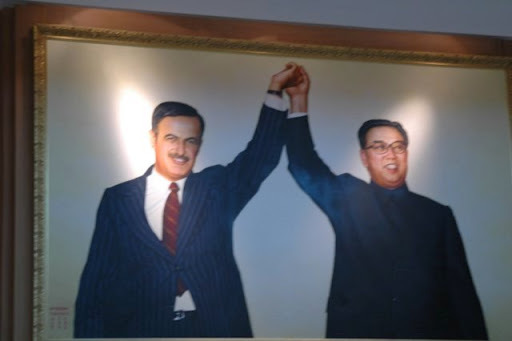 But the two incidents were not the first time North Korean and Syrian military scientists had died during the quarter century the two pariah nations have methodically collaborated. And it would not be the last. The blast at the al-Safir chemical warfare and ballistic missile development facility and the destruction of the nuclear bomb making plant weeks later by an air assault of Israeli F-16 fighter jets, both built with crucial North Korean collaboration, are just two in a series of occasions when Syrian and North Korean clandestine operatives have died working on Damascus’s illicit WMD arsenal. The clandestine weapons collaboration between North Korea and Damascus in recent years has left a trail of bodies from Moscow to the Syrian desert to North Korea in a deadly game of spy versus spy hidden in the shadows of the Middle East conflict. A mysterious blast in North Korea in 2004 near the Chinese border was another of many incidents in which key personnel have met violent ends cooperating with Syria in developing weapons of mass destruction. In early 2004, the United States National Security Agency detected a curious, unusually high cluster of sustained electronic communications traffic between a remote location in the northeast Syrian Desert and Pyongyang. The NSA shared the information with Israel’s military signals intelligence and cypher department, Unit 8200, which designated the information as warranting priority monitoring. 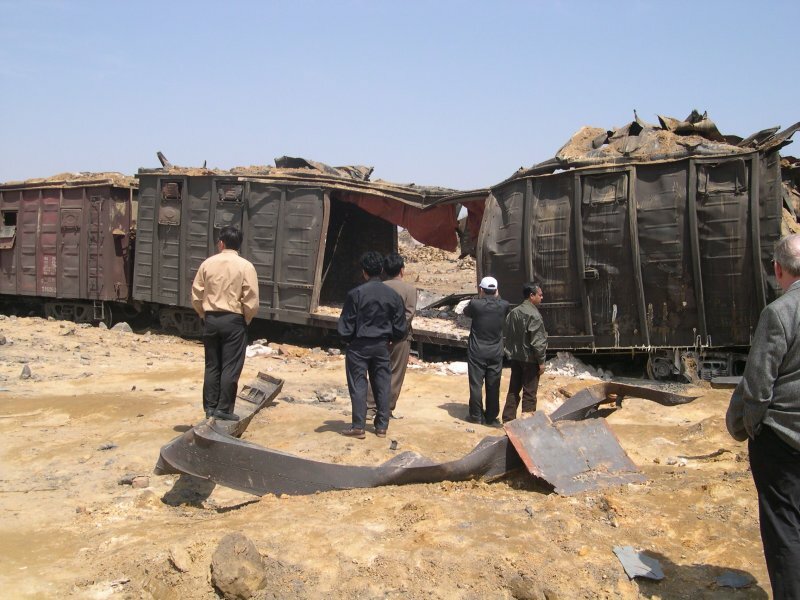 A few months later, on April 22, 2004, an explosion destroyed a train and decimated the small northwestern North Korean town of Ryongchon, in the heart of North Korea’s missile, chemical warfare, and nuclear weapons industrial production infrastructure, as the freight train headed to the coastal shipping port of Nampo with its highly secret cargo. The explosion, measuring 3.6 on the Richter scale and detected at international earthquake monitoring stations in Russia, Japan and the United States, was so devastating that Pyongyang appealed for emergency international humanitarian aid to address the crisis–a highly unusual public action by the secretive regime. The International Committee of the Red Cross was allowed to visit the area and reported 40% of the town had been flattened, more than 160 people killed and 1,300 injured, destroying thousands of buildings and leaving a crater 72 meters deep at the Ryongchon railway station. 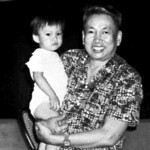 Nine hours earlier, Kim Jong-il, the ruler of the world’s most closed and destabilizing nation, had passed through the station in his private rail-car on the return from a visit to his allies in Beijing. Pyongyang officially said a train carrying fertilizer containing ammonium nitrate and petroleum accidentally came into contact with electrical wires and exploded, but in the years since a clearer portrait of intrigue has emerged suggesting intentional sabotage was responsible for the massive explosion. In fact, the train was destroyed by a mobile telephone remote control device activated by unknown persons nearby, intelligence agencies have since concluded. Never acknowledged was that more than a dozen Syrian ballistic missile weapons scientists and technicians employed by the Syrian Scientific Studies and Research Center (SSRC), the agency in charge of Syria’s covert weapons of mass destruction development program, were killed in the mysterious blast. The Syrian weapons specialists were accompanying a highly clandestine cargo of missile and other components destined for Syria’s weapons of mass destruction development program operated by the SSRC. North Korean military wearing chemical hazard protective suits removed debris and the Syrian bodies from the scene. Within days, a Syrian military aircraft arrived under the auspices of delivering humanitarian aid to the civilian blast victims. The approximately one dozen dead Syrians were claimed by the SSRC, and the Syrian and North Korean military personnel who transported the bodies to the Syrian aircraft were also wearing hazardous protective suits. On May 1, The Syrian military cargo plane departed with the bodies of the dead Syrian SSRC employees. By mid-May, North Korean security officials had found a damaged cellphone still wrapped in duct tape near the explosion and abruptly halted the countries entire nascent mobile phone system, confiscating the 10,000 mobile devices in use in the first national cellphone network, established only months before. North Korea did not allow mobile phone use in the country for another five years. In the period after the blast, Israeli and other intelligence services noted more than a dozen trips to Pyongyang by senior officials of the SSRC involved in their missile, chemical warfare and nuclear weapons development program. Within weeks several foreign governments had privately confirmed that the Syrian plane transported the bodies back to Damascus. Three weeks after the accident, North Korea cut all telephone lines to the rest of the world, likely to either to prevent foreign reporting or to shield their own population from learning news about the accident. “The way it was supposed work was that the train car full of missiles and components would have arrived at the port and some would have been shipped to Syria while others would have been transported by air,” an U.S. official was quoted by MiddleEastNewsline. That source stated that the Syrian aircraft came to bring the relief supply from Syria and returned with the bodies. The bodies were claimed by Syrian Technical Research Center(Centre d’Etudes et de Recherche Scientific: CERS), the French acronym for the SSRC. The US official said the North Korean train cargo was also believed to have contained tools for the production of ballistic missiles. North Korea has sold Syria the extended-range Scud C and Scud D missiles since the 1990’s. Officials said the North Korean shipment to Syria was not meant to have contained chemical or biological weapons, but rather the missile delivery systems designed to attach chemical and nuclear warheads. Foreign relief workers from the International Committee for the Red Cross and the United Nations who surveyed the scene at Ryongchon the day after the blast did not report any chemical contamination. Foreign intelligence sources confirmed that the missiles were assembled at ‘Shin-eum-ri Factory’ near Pyongyang, the rocket engines were made at ‘January 8th Factory’ in Kaechon, the missile bodies were manufactured at ‘No. 26 Factory’ in Namchondong, and chemical warheads at ‘Namheung Chemical Factory’. These components were being transported on the train at the time of the explosion. Japan’s Kyodo News cited diplomatic sources in Vienna saying the explosion measured 3.6 on the Richter scale, a blast equaling about 800 tons of TNT — eight times that announced by North Korea. The blast statistics were compiled by the Comprehensive Test Ban Treaty Organization. 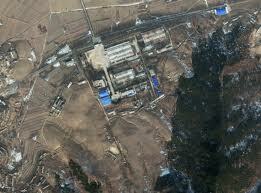 Korean Central News Agency had reported that the power of the blast was that of 100 tons of dynamite. The CTBTO said the explosion was observed using seismological observation stations built to detect nuclear tests in Korea, Japan, the United States and Russia. On May 19 all cell phones were confiscated in Pyongyang, and the next day the ban was imposed nationwide. 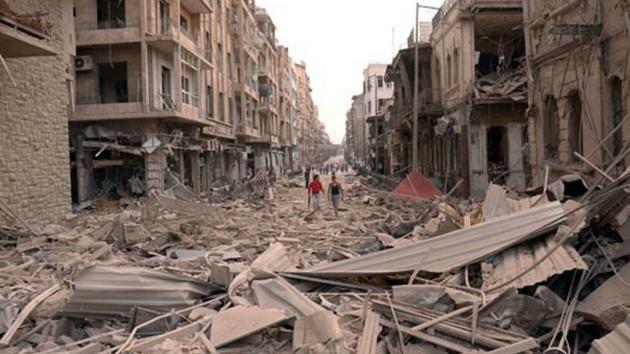 By 2008, diplomats had concluded that the reports of dead Syrian scientists were true. The London Sunday times reported that “Diplomats based in Pyongyang have said they now believe reports that about a dozen Syrian technicians were killed” in the blast. Western intelligence officials, who say they do not know what caused the massive blast, do confirm that the Syrian military technicians were working for the SSRC, and were in North Korea carrying out the purchase of ballistic missile systems designed to be equipped with chemical warheads. “DPRK military-related personnel wearing protective suits arrived on the scene immediately after the explosion and removed debris only from that section of the train where the Syrian group had been aboard,” according to the Japanese newspaper Sankei Shimbun on May 4, 2004.. While North Korean-Syrian military cooperation was known to Western intelligence services since the 1990s, North Korean-Syrian nuclear cooperation was not identified until early 2007, only months before an Israeli airstrike destroyed Syria’s nuclear reactor in a remote desert region near al-Kibar in northeast Syria. When Bashar Assad took power in 2000 after his father died, Israel began updating its intelligence file on the young leader who had just assumed power upon the death of his father. 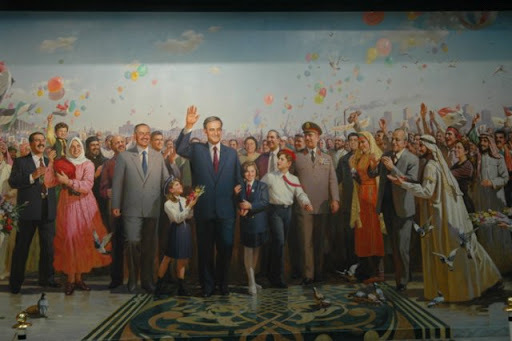 Analysts noted a stream of high-level Syrian and North Korean officials responsible for, according to the Israeli investigative journalist Ronen Bergman. But the information was dismissed by the Mossad, Israeli’s legendary intelligence service, as implausible. In the annual CIA briefings to Congress on WMD proliferation, the CIA did not list North Korea as a supplier of nuclear technology between 2001 and 2006. But intelligence had begun to mount after 2001 that nuclear cooperation between North Korea and Syria had in fact begun “probably as early as 1997”,according to later CIA conclusions reported to congress. Mounting evidence in the following years, in addition to the interception of an unusual amount of electronic communication between a remote Syrian desert location and Pyongyang and numerous reciprocal visits of high level nuclear officials and scientists between Syria and North Korea, was a stream of North Korean procurement of nuclear technology which they delivered to Syria, and materials gathered by Israeli intelligence in break-ins to a Syrian official’s London hotel room, where the contents of his computers were seized. This took place in December 2006, when a senior Syrian intelligence official came to London under a false name. 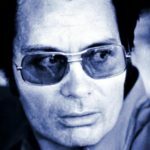 Mossad agents broke into his hotel room and copied the contents of his computer. What they found astonished them. There were blueprints of a nuclear facility and scores of photographs of the nuclear plant under construction, apparently in the Syrian Desert. 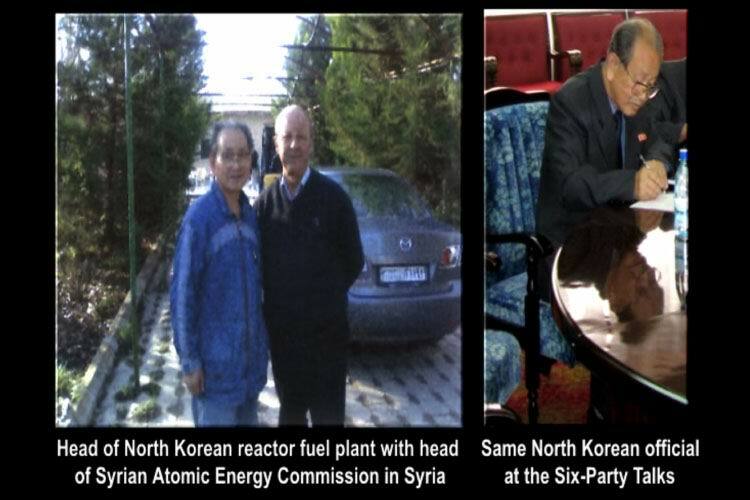 One picture showed North Korea’s top nuclear scientist, Chon Chibu, who was in charge of North Korea’s plutonium nuclear fuel processing site at Yongybon, posing with Syria’s Atomic Energy Agency director, Ibrahim Othman. The license plates of the vehicles in the background of the two men clearly showed the rendezvous took place in Syria. In February of 2007, a senior Iranian general attached to the Republican Guard Command defected to the west. He proved a goldmine of information. Deputy Defense Minister Gen. Ali-Reza Asgari revealed to the CIA and Mossad agents who debriefed him a bombshell of alarming information: Iran was financing a nuclear facility near completion in Syria that was designed and constructed by North Korea. The defection was top-secret and Asgari soon disappeared. Iran announced he had been “kidnapped by the Mossad and probably killed.” In fact, Asgari was whisked to a U.S. military base in Germany where he provided key details before being given political asylum. In August 2007, Israeli commandos dressed as Syrian soldiers were inserted by helicopter into the remote northeastern Syrian Desert to the purported nuclear site near the Euphrates River. They collected samples which were brought back to Israel. Tests confirmed not only the presence of nuclear material, but the signature showed that it originated in North Korea. Both Israel and Washington knew that there were North Korean specialists working at the site. “There are North Korean people there. There’s no question about that,” U.S. State Department official Andrew Semmel was quoted as saying in the aftermath of the attack. That September 3, a North Korean ship, the Al Hamed, arrived at the Syrian port of Tartus with a cargo manifest claiming to be carrying cement. 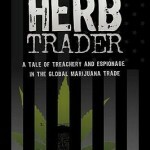 An Israeli agent was monitoring the ship and took photographs of the cargo. Israel contends the vessel was delivering key nuclear material for the plutonium weapons plant. Three days later, and two months after the deadly blast at the Aleppo chemical weapons site, eight Israeli F-16 fighter jets mounted the stealth air strike on a top-secret plutonium production nuclear weapons facility being built under contract by North Korea near al-Kibar . Ten more North Korean nuclear scientists and technicians were killed in the Israeli assault. The nearly completed North Korean-designed and built nuclear facility was the result of a secret pact signed by senior North Korean government officials with Assad in June 2002. The estimated $2 billion nuclear weapons facility in Syria was partially financed by Iran. North Korea was additionally paid with five annual deliveries of 100,000 tons of Syrian wheat, in a $120 million-deal personally signed by Assad, documents in the Syrian president’s handwriting show. The bodies of the 10 North Korean nuclear advisers killed in the Israeli bombings were returned to North Korea in October. Undeterred by either the military strike on the Syrian nuclear facility in September or the July explosions at the chemical weapons facility, North Korea and Syria exchanged high-level weapons delegations for urgent meetings immediately in September, October, and November. On September 22 2007, a delegation of Syrian diplomats, led by leading Ba’ath party figure Saaeed Eleia Dawood, was met by Kim Yong Nam, head of the Supreme People’s Assembly. In November 2007, North Korean ground-to-ground missile engineers secretly returned to Syria to hold talks on how to resume tests to arm with chemical warheads the ballistic missiles Pyongyang provided to Damascus. The objective was to extend the range and accuracy of Syrian missiles to be able to reach the entirety Israeli territory. In February 2008, Hezbollah” chief of security” Imad Mughniyah was assassinated in downtown Damascus. 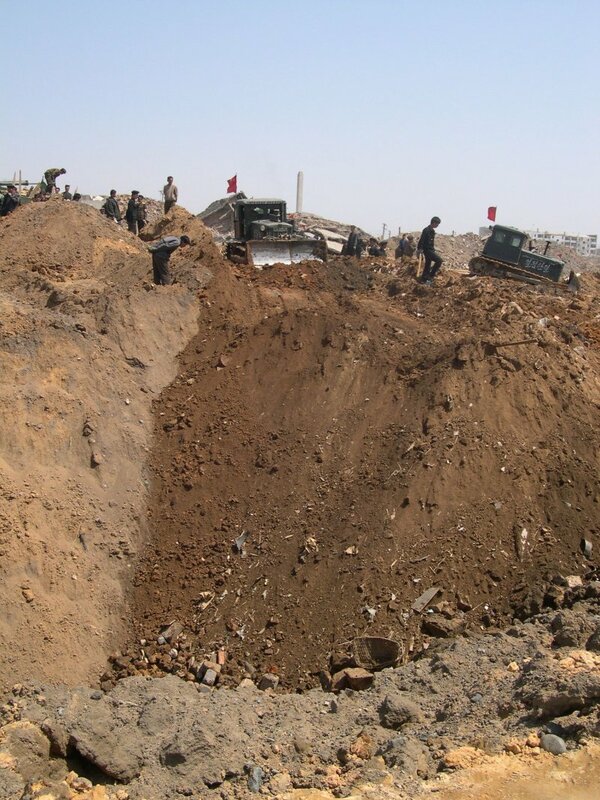 Mughniyah had made several trips to Pyongyang and coordinated North Korean assistance to Hezbollah, which included a variety of conventional weapons, including surface-to-air missiles, training by Pyongyang of their guerrilla fighters, and the sophisticated construction of a North Korean-designed and built underground tunnel network in southern Syria along the Lebanese border. Mughniyah was also one of the most-wanted terrorists and bomb-makers in the Middle East, widely recognized as the mastermind of the bombings at the U.S. Marine barracks and embassy in Beirut that killed hundreds of American troops and diplomats in the 1980s. Israeli intelligence had information that Mughniyah was plotting a military attack in retaliation for the Israeli strike against the North Korean-built plutonium weapons facility, according to a detailed report by Der Spiegel in 2009. 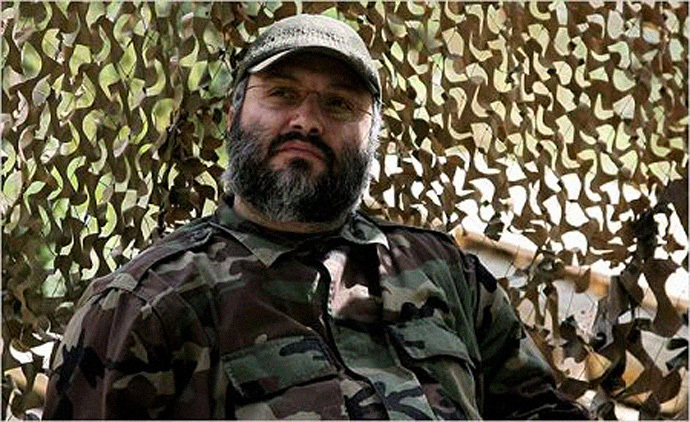 On the night of February 12, 2008, Imad Mughniyah attended a party at the Iranian embassy in Damascus where other guests included the Hamas leader Khaled Mashal and the Syrian official in charge of coordinating covert weapons projects with Pyongyang, Gen. Mohammed Suleiman. After leaving the reception, Mughniyah was killed when a bomb placed in the headrest of the driver’s seat of his Pajero exploded. Six months later, on August 2, 2008, on the coast near the Syrian city of Tartus, Suleiman was relaxing at his weekend home. Suleiman was Assad’s top military and security aide in charge of Syria’s covert weapons, including their missile, chemical and nuclear weapons-development program. Suleiman was also Damascus’s chief liaison with North Korea. Charged with ensuring the security of the North Korean scientists, military advisors and technicians stationed in and visiting Syria, Suleiman had made numerous trips to North Korea to personally oversee the procurement of nuclear and, chemical weapons, as well as ballistic missile components. Accounts of what happened next vary depending on what sources are cited, but agree that Suleiman was in his vacation home when assassins’ bullets killed him while he was eating at his dinner table with family and friends. A yacht with Israeli navy scuba divers and snipers was two kilometers off the Syrian coast. According to the London Sunday Times, two scuba divers with guns in water-proof cases swam to shore, identified Suleiman and both fired one shot, hitting the chief of Syria’s missile, chemical and nuclear weapons program in the head. Other reports suggest Israeli snipers firing from the sea vessel. In the 1990s, the commander of the Russian Military Academy for Chemical Warfare, Gen. Anatoly Kuntsevich, was also the top adviser on chemical weapons disarmament for then-Russian president Boris Yeltsin. But, as the former Soviet Union disintegrated, Kuntsevich secretly took on lucrative freelancing opportunities on the international chemical weapons black market. In 1993, through a front company Kuntsevich created, he provided Syria 800 kilograms of key chemicals, smuggled from the Russian Military Academy for chemical warfare, to produce a sophisticated version of VX nerve gas which was adapted into chemical warheads. Kuntsevich worked secretly for Damascus in exchange for large amounts of money to build their chemical weapons programs until 2002, when he was said to have died mysteriously on a flight from Damascus to Moscow. But Israeli investigative journalist Ronen Bergman notes that his headstone in a Moscow cemetery lists his date of death as three days before the flight’s departure. His death came after several high level demarches from Israel to the Kremlin to force Kuntsevich to cease his chemical weapons activities went unaddressed. And in 2010, the Russian deputy head of the GRU, the military intelligence agency, died in a purported swimming accident in Damascus. Israeli agents are suspected of being responsible for both deaths. In July 2012, the core leadership of Syria’s military and security services were killed or injured in a bomb attack at the headquarters of the National Security Bureau in Damascus. Asef Shawkat, head of military intelligence; Rajha Daud, Minister of Defence; Hesham Bakhtiar, head of the National Security Service; and Tourkmani Hassan, Chief of Staff, were killed in the blast. What went largely unnoticed was the assassination four days later of Dr. Nabil Zougheib, Syria’s top missile scientist and head of the missile development program for the Syrian Scientific Studies and Research Center. A trained missile engineer, Brig. 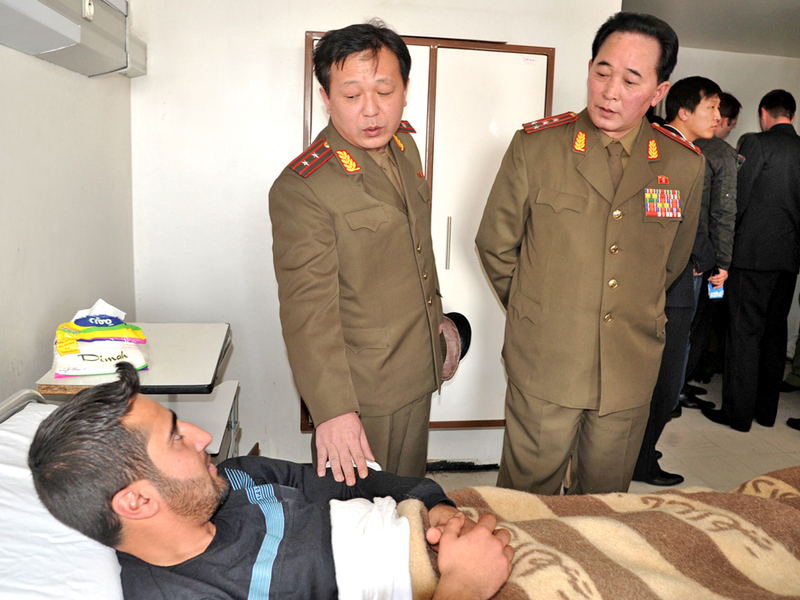 Gen. Nabil Zougheib was a frequent visitor to Pyongyang. He had directly supervised North Korean missile engineers weaponizing North Korean supplied ballistic missile with chemical warheads. “We have seen assassinations to people who hold key positions in research programs where the aim was to stop these research programs as with Doctor Nabil Zougheib,” Damascus based Syrian journalist Alaa Ebrahim said in media interviews. They were only the latest in a long list of dead scientists who have worked on Syria’s weapons of mass destruction development program over the last decade. 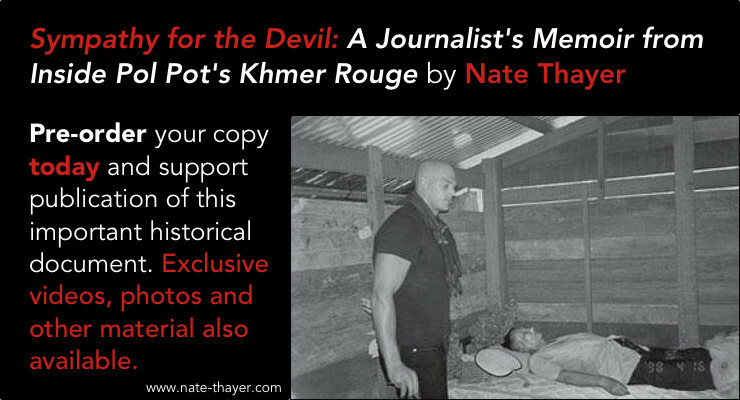 Nate Thayer is best known for having been the only person to interview Cambodian dictator Pol Pot 18 years after he fled to the jungles after presiding over the killing of nearly 2 million of his countrymen, but his Award-winning 25 year career as an investigative journalist has recognized him as one of the most acclaimed foreign correspondents of his generation. Incredible info — Ok, how about NKorea and Iran? Good stuff. Might be no harm for Israel to have some competition on the nuclear front. Might stabilise things a little. Is a freelance journalism career a Sisyphean delusion?